A very reliable series for personal use & small workgroups. The LaserJet 4100DTN includes a JetDirect network card, a duplexer for double-sided printing, and an extra 500-sheet cassette. 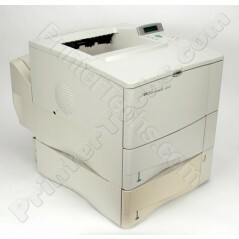 Other models in this series include HP LaserJet 4100, HP LaserJet 4100N , HP LaserJet 4100TN . HP part number is C8052A. The LaserJet 4100 series is the faster successor to the very robust HP LaserJet 4050. This is a wonderful printer for personal use or small workgroups. This model includes networking capability, duplexing capability, and an extra 500-sheet cassette. 15.2" x 15.4" x 22.2"